‘He Won’t Know it’s Paleo’ AIP Cookbook – Interview and Giveaway! Today, author, blogger, wife and mum Bre’anna Emmitt from He Won’t Know it’s Paleo joins us for a chat! Thanks so much for your time Bre’anna – and huge congratulations on the publication of your first cookbook He Won’t Know it’s Paleo! 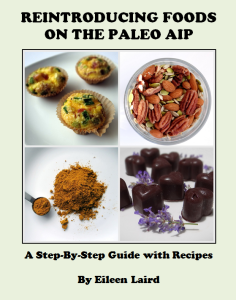 It is a beautiful book with gorgeous, inspiring recipes that, as you say, “bridges the gap between a standard diet and the paleo Autoimmune Protocol”, and in such a delicious way! For those of you that don’t know, the name of Bre’anna’s blog came about after Bre’anna started preparing paleo meals for her husband and family – and it was 6 months before she told her husband! AIP Reintroductions – How Phoenix Helix Helped Me!